Reissue of what may be the ultimate acid-rock album. Listen closely and take heed, for what we have at hand here is not only far and away the reissue of the year, but single-handedly some of the most potent medicine that a dedicated tripper could possibly lay his/her paws upon. Little else you will ever encounter in this life or any other will singe your synapses or tattoo your brain quite like this. Serious psych/prog vinyl collectors think nothing of forking over $600 for Archaia when it pops up (almost never), and it’s no mistake, for this deadly mindbomb resides near the summit of ’70s french lysergic monsters, among that elite coterie of artists that includes Heldon, Lard Free, Spacecraft and Igor Wakhevitch. Tensely suspenseful, profoundly sinister and completely unnerving as only the french know how to be, the vibe on Archaïa couldn’t possibly be more remote from the krautrock model of psychoactive sonics, to which, this and the aforementioned four artists lay waste. From the start, thick billowing tides of analog warmth cocoon the listener in amniotic suspension as a huge, phased, subaquatic bass rises from the depths to the tolling of a bell. This is followed by a haunting synth line whose spooky “singing” tone never fails to send shivers down my spine. Suddenly, Pierrick Le Bras’ and Philippe Bersan’s choral voices of doom enter. Soleil Zeuhl’s press release for this CD would have you believe these are zeuhl voices (i.e., repetitious, incantatory and operatic, a hallmark of the zeuhl school of wagnerian jazz-prog that emerged in the wake of the french group Magma. ), and perhaps they are. But in the context of this music’s framework, the result feels like something else entirely; it’s just that what that something is remains elusive, but damn if it isn’t creepy as all hell anyway. Écoute ! SOLEIL ZEUHL is a new french label that, for obvious reasons, needs your support. 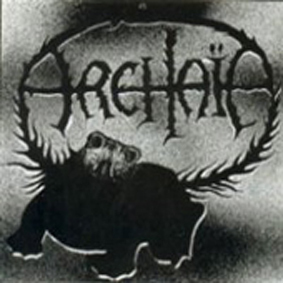 I was going to review this CD for “La Menagerie” ( page 24 ) but while the list was coming together, plans were already underway to reissue this eponymous debut by Archaïa. And a good thing too as this one is priceless. Azahar arranging Magma compositions ? A Frohmader /Art Zoyd collaboration ? Albums like this are so original that they almost defy description. This is dark, cthonic music. A strange amalgam of Pandemonium-like analog synthesizers interspersed with Crimson-like bass and distorted fuzz guitar. The vocals are insistent, like Klaus Blasquiz with Syd Barrett’s drone ; chromatic, urgent, psychedelic. There are very few percussive elements on the first half of the original LP, the bass guitar often acting as a “sequencer”. The buzzing and dissonant synth parts that are interspersed among the compositions are the album’s most original components, there was certainly some Heldon influence here. There is still no traditional drum-kit on what was the second side of the LP, although the percussive elements is more pronounced. There’s no question here of this group’s allegiance to the Magma tradition, but Archaïa is no more mere clone, its electronic element being highly pronounced. The results will appeal to Zeuhl, RIO and some psychedelic and electronic listeners. Soleil Zeuhl has added three excellent bonus tracks : one, “Armageddon” is a studio piece from 1978 and there are two live pieces 1978 which add Patrick Renard on drums. A fantastic album by any stretch of the imagination, this one is a considerably intelligent maiden voyage for the new label. Ah, new chtonian rumbles from the invisible subterranean, otherworlds of MAGMA. Ancient echoes of ’77 and ’78 are unearthed. They form reflected, digital, light-bursts into 1998. Zeuhl lives anew and obviouly Magmoid aliens have inserted their DNA into ARCHAÏA. It isn’t exactly MAGMA but who wants that anyway ? It is MAGMA stream-lined, re-worked, reinterpreed un the spirit of WEIRD but worthy. No sweet female vocals nor castrated Vanderian screeches here. It is more on the sombre, creepy, advancing armies of darkness, side of things. In other words-cool. I enjoyed this Magmaesque madness. There are 11 tracks, ( 3 are bonus cuts, last 2 live ), for 1998 CD re-release. This is delightfully whacked-out guitars, bizarre french vocals, and rampant-in-heat, bass work with tons of effects twisting and turning it all into crazed zeuhlian dimensions. Hope you like fuzzy guitars, interesting synths, distorted bass, and ritualistic vox. Definitely dated, late 70s stuff but hey it is more fun than a barrel of Vanders ! You’ll hear traces of TONTO ÔS EXPANDING HEAD BAND synths, that Manuel Göttsching, Gibson SG guitar noodling, and more goodies I leave for you to discover on your own. You can’t go wrong here wih Pierrick Le Bras on guitars, keys, and vocals. Michel Munier is superbly twisted and innovative bass. Philippe Bersan is vocals, keys and percussion. Alain Evrard is drums and keys on live tracks alongside Patrick Renard on drums. Recommanded strongly for zeuhlians and magmadytes. Yet another Zeuhl rarity has made its way onto CD. This mighty scarce and sought after record, worth several hundred on the original vinyl if you can find it, is that very strange brand of progressive rock influence by Magma. Archaïa began as a trio of guitar, bass and keyboards, with vocals and the occasional percussion. Recorded in 1977, th CD reveals a somewhat dated guitar sound, drenched in fuzz (that will delight psych and older progressive fans), somewhat cheesy keyboards and a percolating bass style and sound (albeit with less distortion), with some of the burping, rhythmically-oriented attack, sonority and style of Magma bassist Jannick Top and his progeny. It also has that late-60s, early-70s, underground sound, recorded on the cheap, but in a way that adds character. The vocals veer towards the strange with a thin, reedy baritone and a more luxuriant low tenor with a rich vibrato that recalls Magma’s Klaus Blasquiz. Archaïa sought to create a singularly bizarre take on Zeuhl music and succeeded. “Soleil Noir” is rather like the work of another Zeuhl band, Eskaton, but replacing the female singers with males who sing an open, oddly harmonized and distinctly french prog style melody. The high, oscillating synthesizer of “Le Grand Secret” is undoubtedly indebted to “Tröller Tanz” from Magma’s Üdü Wüdü. The echoplexed guitar and repetitive, droning structures, the buzzing synthisizer timbres and the cosmic tenor of “Sur Les Traces du Vieux Roy” suggest a hybrid of Terry Riley, early Tangerine Dream, and Pink Floyd just after the departure of Syd Barrett, all colored by the magmaoid influence. To top things off, Soleil Zeuhl has managed to unearth three previously unreleased bonus tracks. By 1978 when these tracks were recorded (one in studio, the other two from live performances), the line-up had changed, adding a proper drummer and a new keyboardist for the live tracks. Archaïa is the unlikely meeting of a drumless Magma and a stringless Art Zoyd, with a serious dose of pataphysical humour. They were an original trio who didn’t indulge in the comfort of the meaningless copying of the models of the time. Zeuhl music it is but in a subtle, clever way, never allowing itself to drift into the pretentious lyrical bombastics of some failed clones of Christian Vander’s band. Without drums, but with a guitar ( Pierrick LE BRAS ), with original scattered keyboards, with pataphysical and apocalyptic lyrics, Archaïa is a fascinating turn for this music, one not too far from the harsh, persistent screeches of King Krimson. Re-released here in a luxury digipack, given an excellent sound, and containing 3 bonus tracks (including 2 live ones) which are more than mere documents. This is an unexpected CD release, but a totally justified one. Certainly one of the best re-editions of the Zeuhl years in France in the seventies. What will be the next ? This eponymous album, recorded without the aid or backing of a record company, was french trio Archaïa’s sole recorded effort and is a lost psychedelic blast of the most freakish, misshapened sort that is as captivating as it is terrifying. Formed in 1976 by Magma fanatics Pierrick Le Bras and Michel Munier, the band’s goal was to play something approaching that group’s music but via a different path: they aimed to use only percussions–no drums–and to make full use of guitar and keyboard. The foundation on most Archaïa songs, then, became Munier’s throbbing bass oscillations that take on a bit of a sinister weight that melds with Le Bras’ guitar and third member Philippe Bersan’s keyboards in eerie fashion. The droning, medieval-like chants that occur throughout the songs could well be an extension toward transcendence, but in this context sound more like underground pagan rituals performed in the woods by mysterious robed individuals. If you were to come across such rituals, your eyes would likely be glued to the scene even if you wanted to run away screaming. Archaïa acts in much the same way, although it is not in any way evil, only darkly unknowable and lurking in the outer reaches of consciousness, in the part of your mind that invents twisted scenarios out of things as simple as sounds. In its claustrophobic, insular, shadowy way, the album is hauntingly beautiful and totally unlike any other progressive psychedelia created ; in fact, its closest antecedents might be practitioners of ambient music who arose over the two decades subsequent to Archaïa’s release. The music is certainly atmospheric, nebulous and murky in a very tangible way. It feels heavy even without the aid of drums, and is less driving than it is amorphous and engulfing, absorbing every stray sound that comes near it, like a black hole. By 1978, Archaïa had added drummer Patrick Renard to their touring lineup creating a sound that was more driving–in fact, closer to straight progressive rock–while still remaining enigmatic, and that change is reflected in two of the three bonus tracks included on this spine-tingling Soleil Zeuhl reissue. Soleil Zeuhl is the reissue arm of the Soleil de Gaïa label which released the Murder In The Cathedral album. Archaïa is their first release and reissue an apparently rare and much sought after french release from 1977. The CD was mastered from the original tapes and also includes an unreleased studio track from 1978 and two live tracks from the same year. Archaïa was formed by Magma fans and while there are clear Magma traces in Archaïa’s music this is far from being Magma clones. The intensity and vocal style of Magma is present. But the band draws more on psychedelic influences making this something of an intense cosmic magmaesque prog-psych trip. The guitar has a wild fuzzy sound and the synths an eerie Twilight Zone quality that gives the music its psych edge. The music as a whole is more along progressive lines being characterized by varied tempos and meters and moving rapidly through a series of themes. The band especially likes to explore more other wordly atmospheres. Sometimes a chanting Middle Eastern bazaar, at others a haunting house of screams and creaking doors accompanied by frightening but classic keyboards sounds. The songs really flow well from one to the other and I couldn’t imagine not listening to this in one sitting. Possibly most exiting of all are the two live tracks from 78. The music is far more intense than anything from the studio album, due in part to the wildly swirling keyboards and deep bass and drums. These tracks are less overtly psych influenced and perhaps stay a bit into fusion territory though the fuzz guitar is still present. Great bonus tracks featuring a side of the band that never released an album. In summary, psych fans who also dig intense progressive rock will love this disc. A gem from the 70′s that almost got away.